Recently I went to my native, which was saw happiest and sad moments of my life. to meet my childhood friends, my schools at Bhadravathi. That i will post later. On sunday morning I with my friend went to Koodli, which i frequently visited during College Days. Koodli is a small village with very Big heritage behind. It is 16 Kms from Shimoga on Holehonnur – Channagiri Road and the same distance from Bhadravathi, Steel Town. Rivers Tunga(ತುಂಗಾ ನದಿ) and Bhadra(ಭದ್ರಾ ನದಿ) -Joins here, hence the name Koodli . From here onwards both rivers together became TUNGABHADRA till it joins KRISHNA river in Andra Pradesh and finally dissolves in Bay of Bengal. TUNGA RIVER born in the Western Ghats on a hill known as Varaha Parvata at a place called Gangamoola. From here, the river flows through two districts in Karnataka -Chikmagalur District and Shimoga District. It is 147 km long and merges with the Bhadra River at Koodli. The river is famous for the sweetness of its water. There is a belief that ” Thunga panam Ganga snanum” which means we should drink the water of river thunga and take bath in river Ganga. BHADRA RIVER born in the Western Ghats range, and flows east across theDeccan Plateau, joined by its tributaries the Somavahini, Thadabehalla, and Odirayanahalla. The river flows through the Bhadra Wildlife Sanctuary. A dam was built across the river near Lakkavalli. The Bhadra meets the Tunga River at Koodli. On the banks of the confluence there is an age old temple built by Hoysala and Ikkeri Kings called Rameshwara Temple. A beautifully maintained, with gardens, lawns and more over neatness by ASI (Archelogical Survey of India). Behind the temple a small roofless temple with nandi denotes the exact point where the two rivers meet, and is considered to be very sacred. At sangama lord called as Sangameshwara. At confluence point there will be always water. While going to the river on the left side we can find another famous temple, which is Kshetra Devate Sri Chitamani Narasimha Swamy Temple beside the Sangameshwara temple.It belived to be installed & worshipped by Sri Prahlada. There are two mutt in the Koodli. One is Shankara mutt (Advaita Philosophy) & another one is Akshobhya thirtha Mutt (Dvaita Philosophy). There is very old Indian style school of learning for Shankara philosophy, called the koodli mutt. This has a long history: onetime in 15th or 16th century, the chief swami of shringeri had gone to a teerthayaatre, probably to kashi. He did not return for a long time, which caused the deputy chief to take up the chief’s position. But the chief was alive and did return to Shringeri after a few days. But he of course could not go in to the matt where his own pupil was the chief, so he left shringeri and started his own matt at the sangama of tunga and bhadra, kudli, and this came to be known as kudli Shringeri mutt. Now in the beginning of 1900s, a new swami took the position of the chief swamy here. He was formerly the teacher of his highness Krishnaraya Wodeyar the 4th, Maharaja of mysore. This brought good times to this matt again. Between the original founder and this person, few talented persons had been chiefs here, who made this place, keep up the standards. After independence, one particular person was very talented and influential, and made the mutt a noted place again. It has stated by Sri Akshobhya Thirtha (one of the prominent disciples of Sri Madhvacharya) around 13th or 14th Century. Sri Mutt had very good scholar of Sanskrit & Madhvacharya’s philosophy as there Petadhipathies (Cheif Swami) till to date. 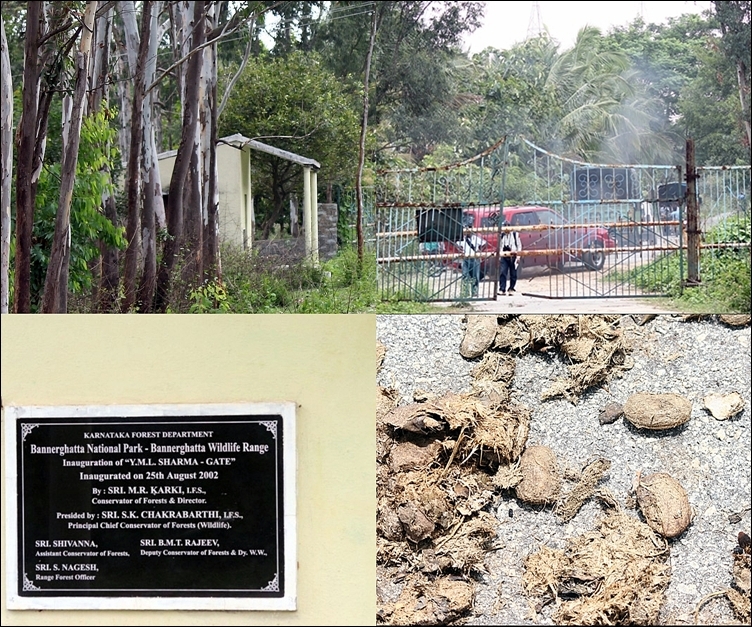 There is very well maintained Goshala (Cow yard) by AAT Mutt. At the entrance of the village, Sri Bhrameshwara Swami welcomes you to koodli. Further you will see Bhavani Shankara Temple, Vidhya Shankara Temple, and few many small temples are there in this single road village. * Onthe Right side of the houses River Tunga Flows and on the Left side houses River Bhadra Flows. * In this small hamlet, the hindus religious place Muslims also reside together. They have built two mosques here. They stay entrance of the village. The Sad thing noticed here is below monuments are thrown on the road side and lies along the cow dung etc..Can ASI give life to these monumnets and shift to safer place. From Shimoga>–> Buses available any time. Buses plying towards Chitradurga, Channagiri passes via Holehonnur. Getdown at Koodli entrance and walk 2kms inside or get down at Holehonnur and catch the Auto to Koodli. Travel time from Shimoga to Koodli is 30min to 45mins. From Bhadravathi>–> Buses available to Hole honnur 14kms and from there get an Auto to Koodli which is 3kms from there. Travel time from Bhadravathi to Koodli is 30min to 45mins. I am really thankful towards the author in this post to create this lovely and informative article live to put us. We actually appreciate ur effort. Carry on the good work. . . .
Hi, I used to be searching by way of the web site trying to find some data and arrived by way of your weblog. I’m amazed by the info that you’ve on this site. It exhibits how nicely you comprehend this subject. Saved this web web page, should come back once more for long term. You, my pal, ROCK!!! nanna hallia photos i net nalli nodi tumba khushiyaytu. thanks. dear Ramesh,, it is a woderful thing you did.many people do not know about such a sacred & beautiful place where Achrya shankar blessed by jaganmatha sharadhamba. Great work sir. It took me through a e-pilgrimage of the place. Ramesh,very nice article on Kudli,thanks for taking me to this place by ur good blog.Good to know bus facility has increased much these days.I remember walking one time till -8 kilometers to get bus to come to Old town to new colony Bhadravathi.It was such a hard task.I have plans to visit with my kids,based on ur report,I must see this place have a good darshana of the Lord and also have bath in the holy confluence of Tunga-Bhadra. thanks a lot for all the info. myin-laws are planning to go to shimoga and koodali… is there ay place to stay at kudali??? how far is sringeri from judali? are there buses?